Hydraulic Cylinders are manufactured for applications where pressure is ranging from 10 kg/cm2 to 400 kg/cm2. Standard Cylinders are available with robust design for working pressure of 160 kg/cm2 & test Pressure of 200 kg/cm2. 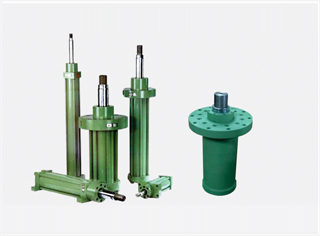 Custom made Hydraulic Cylinders are manufactured according to the specific dimensions, pressure & temperature requirements. Hydraulic cylinders are manufactured from 32mm bore to 350mm bore size with various stroke lengths. Tubings for the Hydraulic Cylinders are M.S. Honned & Hard Crome Plated & Piston Rods are EN8 Ground & Hard Crome Plated. Tie rod construction as well as welded construction designs are available.